You and your friends can spend countless hours in your outdoor veranda, and that alone should justify beautifying that part of the house. The climate in Bacolod City is perfect for outdoor entertainment. You can use a covered patio or outdoor terrace as an entertainment venue whether you have just a few friends over or if your living room becomes too crowded with too many guests. Use stylish chairs and tables where guests can sit to talk, eat or drink. These days, home stores offer weather resistant furniture that resemble wicker and rattan. These offer more aesthetic appeal than the usual monoblock charis and tables. You can also use hard wood that is resistant to rain and heat. 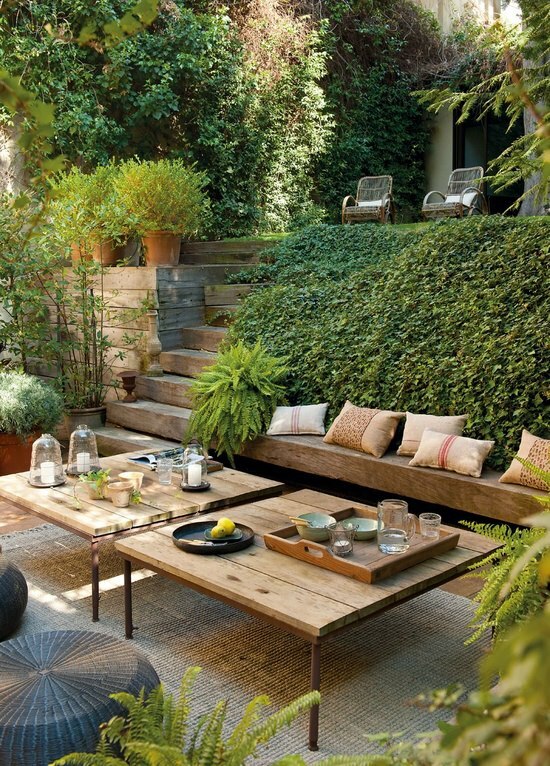 This choice can also give your terrace a rustic appeal. What better place to put a hammock than the outdoors. Place one or two in shaded parts of your terrace next to shady trees. Hammocks can also look good in a covered patio. Make sure that you install the hammocks securely to avoid accidents. Use ambient lighting to give off a cozy ambiance. Use garden lighting near plants and flowers. You can also light up the area by placing lights on walkways towards your outdoor veranda. You can also use hanging lights or ceiling fans with ambient lights for covered patios. Avoid using white light or fluorescent bulbs that may ruin a cozy ambiance. Most Bacolodnons love barbequing food. This is the perfect location to install a BBQ grill. Place the grill a few feet away from your sitting area to prevent smoke from disturbing guests lounging about your terrace. Get a nice looking BBQ grill at a home store or have one permanently installed not far from your veranda. Who says art is just for the indoors? Only few people think of investing in art pieces for outdoor entertainment areas. You can place clay sculptures and other weather resistant art work in your garden terrace. Paintings can be hung in covered patios. Highlight your art pieces with some ambient lighting. Other things you can add to your decor are umbrellas, soft cushions and throw pillows. Use plants or potted flowers to beautify the area. A nice bonsai centerpiece can make a great icebreaker. A veranda or terrace can add appeal and value to your home. Consider this addition to your house and discuss your options with your home builder or architect. Visit our Facebook page at https://www.facebook.com/BacolodCentrale to get more home design tips. Find the perfect lot for sale in Bacolod for your future home with a nice veranda. Centrale Bacolod is the latest and one of the best subdivision developments rising in the center of the city, next to Eroreco Subdivision and St. Scholastica’s Academy. This entry was posted in Centrale Bacolod and tagged Centrale Bacolod, centrale lots for sale bacolod, Home Design Tips, Lots for sale Bacolod. Bookmark the permalink.